These grilled stuffed pork chops are filled with smoked Gouda cheese, ham and basil pesto that blends and melts together perfectly during cooking. 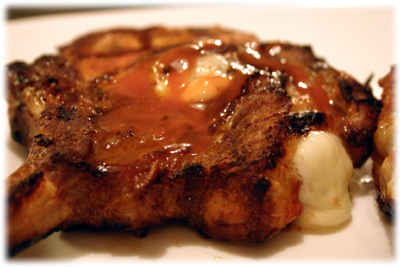 The real secret to the taste of this stuffed pork chop recipe is the smoke flavored cheese. Don't substitute anything else. After they're grilled and you first cut into them the visual appeal and aroma are amazing. The first bite of these juicy, smoky stuffed chops is even better. Use your favorite softer cheese like Havarti, mozzarella or even smoked cheddar if you can't find Gouda, just make sure the cheese is smoke flavored. 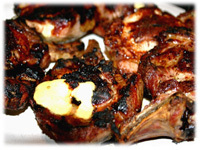 Likewise, Genoa salami or pancetta instead of ham adds unique flavor to these stuffed pork chops. 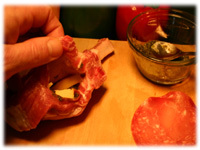 Tip: If you can't find a frenched pork rib roast then have your butcher cut you 4 pork rib chops at least 1" thick. "Frenched" means the meat has been removed from the bones of the roast. Variation: If you can't find or don't like smoked Gouda cheese then try any other softer variety like mozzarella, Havarti or even cheddar. As long as it melts nicely during cooking. Oil the grates of the grill. 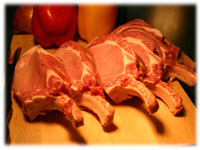 If using a frenched pork rib roast slice down between the ribs to create 4 separate rib chops at least 1" thick each. 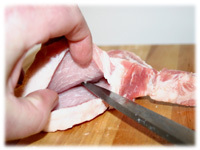 Lay your hand flat on top of a chop and with sharp knife cut into the side of the chop opposite the rib to make a deep pocket to hold the stuffing. Try not to cut all the way through to the back, top or bottom or the cheese will leak out of your stuffed pork chop during grilling. Place 1 slice of salami or ham flat in the pocket. 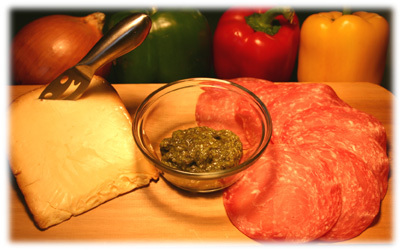 Add 1 teaspoon of basil pesto on the salami or ham and spread around with your finger. Place a second small slice of salami or ham in the pocket on top of the cheese/basil and fold under the first slice of salami/ham. This helps seal the ingredients in the pocket. Sew a toothpick through the chop to close the opening of the pocket so the ingredients don't totally leak out during grilling. Cover both sides of the chop with 1 tablespoon olive oil and 1 teaspoon of freshly cracker black pepper. Variation: Try using a hot pepper infused olive oil instead - available at most larger supermarkets or fine food stores. 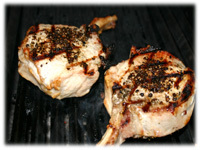 Place chops on the pre-heated grill and cook over direct heat. After 8 minutes slightly lift one of the stuffed chops and peek underneath. If it's showing nice grill marks and the surface is crisping up then flip the chop. After flipping check after 8 more minutes with an instant - read thermometer inserted in the meat (not the middle ingredients) for a temperature of at least 155F. 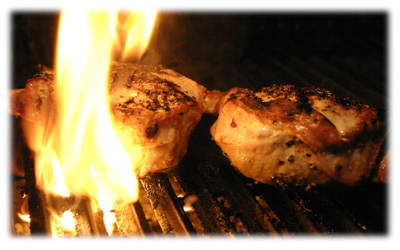 Temperature will rise an additional 5 degrees after the meat is removed from the grill and rests to an ideal internal temperature of 160F. Line a cookie sheet or baking pan with paper towels and place a small cooling rack on the paper towels. Remove the cooked stuffed pork chops to the cookie sheet and cover with tented aluminum foil that has a small hole cut in the top to allow steam to escape. 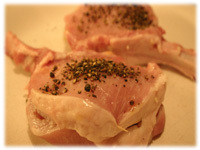 Let the stuffed chops rest at least 5 minutes before serving.